This watch is very sought after and rare. Beware of sellers on eBay offering similar Seiko models, claiming it to be the Bond watch, but there is only one, and that is the one pictured here, the Seiko G757 5020. Look for the version with black 'horseshoe' (the shape around the digital screen) and metal band. Buyers should watch out for the wording SPORTS 100 on the black bezel. There is a model G 757-5000 available with Silverwave wording on the black bezel. The shape is all the same, except the Silverwave wording and a slightly different LCD display. Since the Seiko G757 Sports 100 is currently hard to find and quite expensive if you do find it, it's worth looking at affordable alternatives for this watch. If you want a Seiko, look for other vintage Seiko G757 models on eBay and you'll find similar watches, without the black 'horseshoe', at reasonable prices. 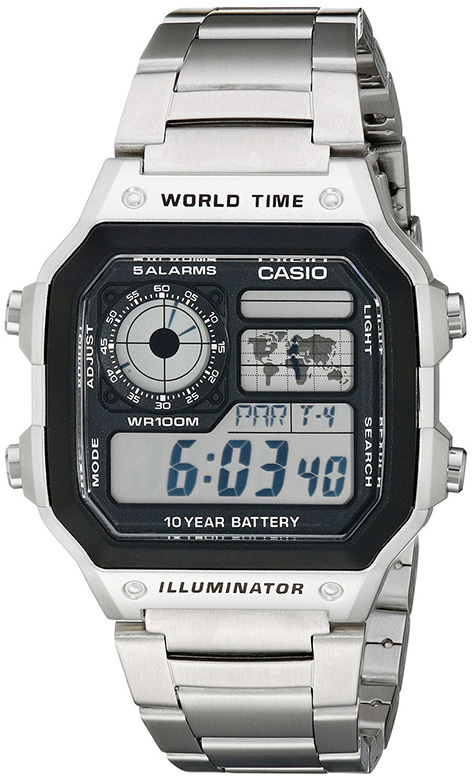 Casio currently sells a similar looking digital watch, the Casio AE1200WHD-1A, with silver coloured case and stainless steel band. The watch doesn't have a Fabergé egg tracking option, but does feature World Time, Stop Watch, Alarm, LED Light with Afterglow. Available on Amazon for only $22. I have the G757-5020, how much would u pay for it? I used to own a Seiko Sports 100 Chronograph G757 [ horse shoe ] and would be interested in finding another one. Does anyone have one in good condition they might like to sell for a reasonable price? I know that the watch was used in the James Bond movies so I'm not interested in one that someone wants to sell based on that. The watch model was a standard Seiko for its day and I'm only concerned with finding one as I liked the features. Ich hätte gerne mal gewusst ob diese Uhr mit Melody ist und was sie kostet! Is this the the most desirable quartz watch ever made? I tend to think so. The G757 is the most sought after line of Seiko digitals, and of all the versions, the 5020 is the undisputed King. The Bond connection adds to the appeal, but in its own right this watch is rugged, versatile, and distinctive - a very masculine but handsome watch. A good condition example is going to set you back a four figure amount, and don't think you'll buy one in mediocre condition and refurbish, because parts are virtually non-existent. The non-symmetrical band is almost impossible to find, so weight this up if you are on the hunt. So if you are in the market for a watch with credentials, and don't want to be someone wearing "just another Rolex", the this is a watch worthy of your consideration. I really want this watch, new or mint condition. Please contact me guys if you find one. EBay mostly has regular g757 not the 5020 sport. My eBay id is victoriamerchant or comment here. Much appreciated. I have a sports 100 bond model bought new duty free Sept '81 I didn't know I was buying a future collectable just bought it for the features at the time over rolexs etc. Was into practicality not trinkets. About $150AU at the time. Does anyone have a spare good horseshoe they don't mind parting with ?. I am the proud owner of a 5020. However when changing batteries the jeweller lost the inner bezel on which the functions of the push buttons are placed. LIGHT START-STOP SELECT etc. If anyone with a non-functioning 5020 or this missing part can let me know I would be grateful. Also a small part of the horseshoe has broken off but I can live with that! Hey, I love these classics. I just picked up an "as new" G757-5000 with tags, box and even has the blue protective sticker on the back for AU$2000. Yes, AU$2000, I just had to have it. It's as if I went into a shop and purchased it brand new - AMAZING...... I also have a second fully functioning G757-5000 to use for spares if the need arises. Are you interested in selling me yours? I need to replace the glass crystal on mind. I own the G757-5000 and seeking a replacement rubber or metal band/strap for this watch. Any info or leads greatly appreciated. Thank you! Seiko teamed up with Wired, a Japanese watch company, to "remake" the G757 series, called the Wired Solidity AGAM601. It was made to coincide with the release of the video game Metal Gear Solid 5 as the game is set in 1984 and the main character, Snake, wears one. They were only available via the game companies website, Konami, but are also on eBay (where I purchased mine for way more than the market price) The watch is different as it is a "modern version" but what I like is that the AGAM601 version has the "horseshoe" bezel which I thought was a nice touch.